Learn profitable auto repair shop management from the best! Discover how to find and hire top performers, get new customers and get more work from existing customers here. In 1990 Bob Cooper decided to utilize his background in automotive business management and in developing some of the nation’s most successful auto repair facilities to start Elite in San Diego, California. His objective was simple; to create a global company that would ultimately help other shop owners, and dealerships, develop more profitable, successful businesses in the most affordable and ethical way. Within the first few years our company had grown throughout California, and we had captured the attention of shop owners, trade associations, and major publications all across North America. By hiring talented people, we were able to expand into offering industry acclaimed auto repair sales and management courses, coaching services, twenty groups and carefully chosen services from our ethics-based affiliate companies. Through this expansion, Elite has become the nation’s number one provider of video and audio programs created specifically for auto repair professionals. There are a number of reasons for our success, yet none are more important than the principles we live by: we never put money ahead of people, and we live by a philosophy that the principle purpose of business is to create a customer, not an income. 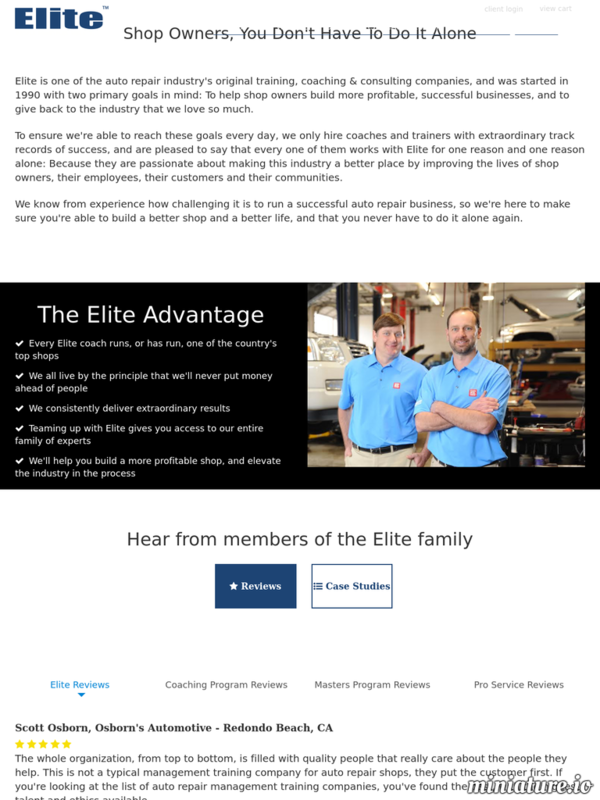 Today Elite is an international company that has clients throughout the world, many of which are the industry’s most successful independent auto repair shop owners, new car dealerships, and aftermarket franchises. We strive to help automotive professionals in as many ways as we can, which is why Elite is the first in the industry to offer audio products and services in Spanish as well as English, and why the breadth and depth of our solutions is unparalleled, worldwide. We understand that our financial success will always be the result of one thing: satisfied customers. We also realize we have a responsibility to our society, as well as the industry, which is why we consciously reinforce the value of ethics in our Elite Membership Podcasts, as well as in all of our products and services. By adhering to these principles, by hiring truly extraordinary people and by maintaining the culture of our company over the decades, we have developed a global reputation as not only the industry’s leading provider of affordable automotive business management solutions, but even more importantly, as the name you can trust. We would like to say thank you for taking the time to read this message, and for your confidence in us. We hope you explore our site, and we hope that like thousands of others, you too will give us the opportunity to help you build a more profitable, successful business, in the most affordable and ethical way. If you would like further information on what Elite can do for you or your company, please call (800) 204-3548. From outside the U.S., call 1 (858) 756-3102, or you can reach us through the Contact Us feature on the site. If you would like to learn more about career opportunities with our company, please visit the Meet the Team page.